A consulting client recently asked how they could resolve a capacity-planning issue on their production report server. They manage a busy report server for a 24/7 international operation. There are several long-running subscription reports scheduled to run during busy times of the day when other users need to run reports on-demand. When some of the subscriptions run, the server slows down and users don’t get very good response for their interactive reports. The server is currently a two node server farm that has plenty of capacity and performance is good with the exception of these infrequent slow down periods. The default setting of zero gives the server some flexibility to balance this on its own. During busy on-demand cycles (when users are running their own reports interactively), subscriptions will still run on the other server but will use limited resources on the throttled server. We can also schedule a command script to change this setting at different times of the day so more threads can be used for subscriptions during off hours. We haven’t found this option necessary. Posted in SQL Syndication, SSRS Administration. I hope everyone is enjoying the holidays. To everyone in the SQL Server community, Merry Christmas and Happy New Year. Spend time with your families and no working during the holidays! First of all, the title is intended to be a little tongue-in-cheek – just a little bit. I’ll explain. Last week while I was teaching a class on report design, one of the students asked “what is the definitive, industry-standard guide for proper dashboard & KPI design?” I thought, well, I know several authors in the industry who have written about this topic but I wouldn’t consider any one of them to be THE definitive guide. Sure, Edward Tufte has written at least seven volumes about how information has been visualized – good and bad – through ages past and on into the modern business world. Stephen Few is known in most circles as the BI dashboard guru and he has a lot of opinions about good and bad design practices. But what is the definitive standard? I’m a firm believer that if it hasn’t been done – and that it needs to be done – that I can do it… in a series of articles about effective report UI visuals, how to choose the best presentation option for a given scenario. This first post will just be a simple starting point to frame the discussion and set the stage. I will begin by reviewing these books and discuss the pros, cons and the applicability to the subject of dashboard and KPI design using the Microsoft product stack. So I must confess that my blogging efforts to date have been on the impersonal side – perhaps even a bit sterile. I really admire bloggers who post daily and weekly, and seem to have interesting things to say about common and simple things. In the coming year, I’d like to change my approach to blogging about SQL Server, BI, Reporting and all things related. I’d like my blog to be more conversational and to read more like a journal and less like a textbook. I had a chance to watch the recorded session from this year’s global PASS Summit on blogging. 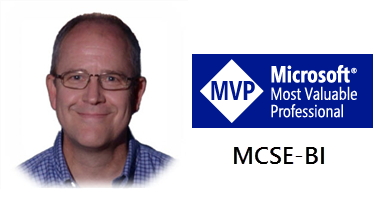 A panel of some of the more prolific SQL Server MVP bloggers talked about their approach. Folks like Buck Woody, Bent Ozar, Adam Mechanic and Rob Farley talked about the importance of sharing your personality while maintaining a balance between professional and personal information. I’ve been writing technical books for over ten years and my blogging efforts have been in the same literary pattern as my books… if the content wasn’t complete and ready for print, it didn’t make it to the blog. So, I’ll apologize up front for my future ramblings and incomplete thoughts as I make an attempt to become a more frequent and perhaps a less formal blogger. With SQL Server Denali on the horizon for late 2011 or early 2012, I’m looking forward to some new book projects. I won’t make any announcements until anything is official. There are significant new developments in the works for the Microsoft business intelligence platform and improvements to the relational platform and tool suite. The first public CTP was released in November but didn’t include a lot of new features. The next Community Technical Preview that contains the cool stuff should be available to TAP program participants sometime in Q1 – which should be plenty to blog about. Until then, I’ll continue to develop material around data visualization guidance and standards for the Microsoft BI platform.